I help the new co-workers to get settled, tell them where things are and who everyone is. Communities receive a large number of applications each year from prospective volunteers. We strongly recommend that you read our FAQs for either Local volunteers or Live in, full time volunteers before submitting an application. Please don’t complete this application form and then apply to the same community from a different source. More than one application from the same person does not increase your chance of being selected. It is important that your application is personal and appropriate to each community that you apply to. In your application, tell us about yourself. Why should we choose you? What skills and interests would you bring? Why do you want to join us? The more information you provide at this stage, the more likely it is that your application will be processed. 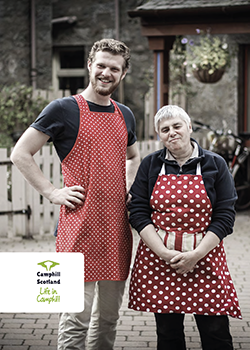 Camphill Scotland does not process applications or recruit volunteers. Each of our 11 member communities manages their own recruitment process. Please read our FAQs for either Local volunteers or Live in, full time volunteers before submitting an application.